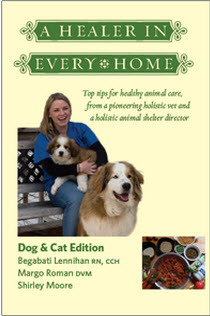 When one of our animals is hurting, be it due to a physical ailment or emotional pain, we want to help. We want to heal. We desperately want to do something to ease the distress. 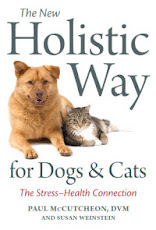 In Kathleen Prasad's wonderfully insightful book, Reiki for Dogs: Using Spiritual Energy to Heal and Vitalize Man's Best Friend, we are humbled to discover that in truth, though we can offer the gift of spiritual energy to our dogs, it is up to them to accept it. And hardest of all, perhaps, is to set aside our own egos, and honor each dog's decision to participate in healing, or not, even though we may anxiously wish to fix or cure his problem. It's not up to us; it's up to him. That can be a difficult message for us humans, who are so used to being in control. 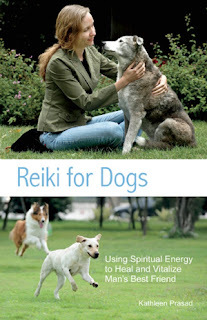 When it comes to Reiki, or other forms of spiritual energy that can flow through us, we can best serve our dogs by allowing what will be, to be. But that doesn't mean that we are powerless to help an animal in his hour of need, whether that is to support him through a health crisis, release fears from former trauma or abuse, relieve sadness and depression, or be fully present with him in the days or months or moments before his last breath. If we know how to work with Reiki, we can be a conduit for this universal energy to flow to our animals where it's needed, creating a perfect sense of balance and peace and harmony. "Those of us who use the system of Reiki are called 'practitioners,' not 'healers,' since we do not manipulate the energy or healing of others. Through our compassionate intention, we simply open more deeply to the universal flow of energy, creating an 'energetic space of healing,' and in so doing, facilitate the healing process of others. Reiki can do no harm and is supportive of all other healing modalities and therapies, both allopathic and holistic." While Reiki practitioners who work with people usually do so by putting their hands in prescribed positions on their client's body, those techniques may not always be effective or appropriate with dogs. After offering thousands of treatments to dogs and other animals over a period of many years, Kathleen has learned that they may not always welcome such direct, hands-on contact, and may even shun it by literally walking away. Dogs, in particular, "are more 'tuned in' to the energetic realm," she says, and are so sensitive that they may find hands-on Reiki to be overpowering. Her advice to Reiki practitioners who want to work with dogs is to be quiet, calm, and nonthreatening. "It's our job," Kathleen explains, "to hold a space of lightness and peace in our minds. In this space, the dog is more likely to relax and open to an energetic connection." Reiki for Dogs is about much more than Reiki. 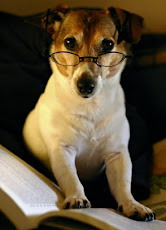 Based on her own experiences, Kathleen writes movingly about how we can open our hearts and minds to connect with our dogs on a level we may never have imagined. She offers a series of meditations and exercises to enhance our ability to do so, and to release our attachment to a particular outcome. If we can learn to do that, Kathleen says, "we also find it easier to be open to the possibility that our dogs may be helping us just as much as we are helping them." Animal Reiki expert Kathleen Prasad is making a rare visit from California to the Boston area to be one of the featured speakers at the upcoming Conference on Complementary Animal Healing in November.